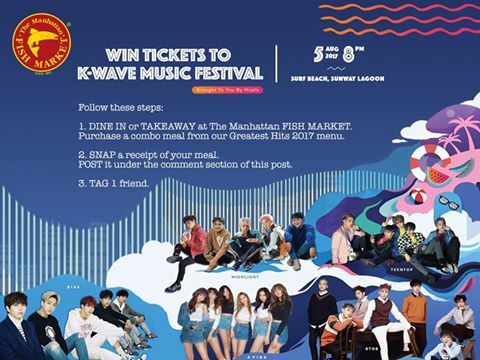 Prizes x 100 winners: 1 pair of K-WAVE MUSIC FESTIVAL (5th August, at Surf Beach, Sunway Lagoon) tickets worth RM444 each. Performers includes APINK, TEENTOP, BTOB and many more. Visit The Manhattan FISH MARKET outlet nationwide (except Cenang Mall & AEON Kota Bharu) and purchase any combo meal from their Greatest Hits 2017 menu. SNAP a receipt of your meal, post it under the comment section of this post and TAG 1 friend below. Visit the contest's terms & conditions for more details.